Interview is an ability assessment tool which decides if a candidate is fit enough to be employed in an organization. Interview is a process in which the candidate has to prove his worth. So a candidate has to prepare himself for the interview in order to impress the interviewers and only if a candidate is successful in exhibiting his talent and skills, he will land a job in the organization. So it goes without saying that an interview is the vital factor which decides if a candidate is to be hired or not. Why are Questions asked to Candidates in an Interview? Interview in itself is a test to know the ability of the candidate. The company before employing the candidate should know if it is worth investing in him. They need to know if the candidate will be an asset to the company and contribute in increasing productivity and growth. So what are the factors that the interviewers are assessing in an interview? When your approach to a problem is positive then you are sure to find a way out of it. If you think that the problem is complicated and impossible to solve, then no matter how much you try, your negative attitude will not give you the desired result. So interviewers need to know how a candidate approaches a problem. Only if the candidate shows signs that he is approaching the problem with a positive attitude, then the interviewers get the impression that he will be able to solve the problem no matter what. Right, the approach is positive. That is a good sign. But more important is to analyze the problem. So does the candidate break the problem into parts and analyze it step by step? Or does he see the problem as a whole? The analytical problem solving skills are important and interviewers target the candidate with such questions which brings his analytical solving skills to the fore. Stress is a part of profession. But how you handle it depends on you. So how do you deal with stressful situations? How do you manage professional pressure? Interviewers will want to know your stress handling capacity and will you be able to perform well under stress. Of course, interview in itself is a stress and how well you handle the interview is an indicator enough for them to know your stress handling capacity, isn’t it? Challenges are countless in a profession. You constantly face challenges from your clients, customers, seniors, subordinates and everyone. Are you strong enough to face the challenges? Or do you surrender to challenges meekly? Are you passionate enough to solve the challenges? As a candidate you need to prove to the interviewers that you are a man ready to face any kind of challenges in your profession. Your communication skills are tested here. How effectively will you be able to convince others with your ideas? How will you be able to pacify an unsatisfied client? How will you motivate your juniors? Any profession demands you to communicate, so that problems do not creep out due to miscommunication. Let the case be of putting forth your ideas or telling your difficulties, only when you say, others can understand. And for candidates, good communication skill is what counts. After problem analysis, now comes the implementation part. How prepared are you to implement the solution? Do you have any last minute jitters? The interviewers need to know about your confidence levels while implementing solutions to the problems. Suppose a plan did not work as expected, are you the one who lets bygones be bygones? Or do you not rest until you get to the core of the problem to see what the mistake was? Failures are a part of life. But to know where the mistake has occurred and learning from it helps you move ahead. So as a potential candidate it is essential that you demonstrate to the interviewers that you are not disappointed by failures and that you learn from it. It is not enough that you just find out where you went wrong. Try to rectify it. Don’t leave it for another time or for the next one. The interviewers would want a candidate who knows where he has gone wrong and how did he go about rectifying the problem thereafter. With such a lot of job seeking candidates in the fray it becomes essential on the part of the interviewers that they pick the best. And as a job seeking candidate you need to satisfy the interviewers with your capabilities and performance in the interview. Types of Questions asked in an Interview? When a candidate faces an interview he will be tested for his skills. The type of questions asked will depend on the job he is seeking. If it is for a technical job, say for the post of a software engineer then technical questions about algorithm fundamentals and math will be asked including the coding skills. In addition to technical grilling, candidates will have to prove their behavioral ability also. Then there are tests on logical ability and analytical thinking also. 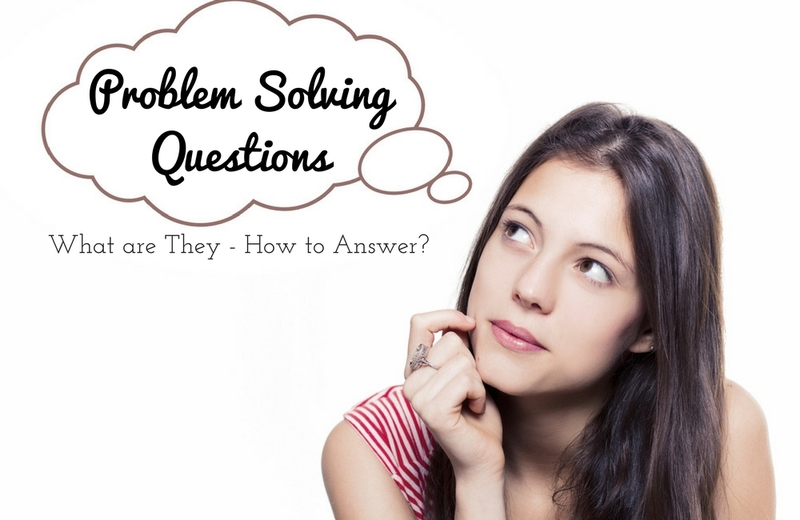 Problem Solving Questions You’ll Get In An Interview? In an interview, the questions asked may be in written format or the verbal one. Written formats are usually conducted in the initial stages wherein they need to narrow down the number of candidates. The written format includes questions on logical and analytical reasoning. After the candidate passes the written interview, he may be subjected to a few technical rounds of interview. The final stage in the interview is the behavioral ability interview which usually seals the fate of the candidate. Be it a manager or an accountant, be it a doctor or an engineer and be it a banker or a teacher, there cannot be an interview without the technical questions being raised. Your technical prowess is the reason why you are being called for an interview. Expect tough and challenging technical questions if you are applying for a senior position or if the company is famous and popular. It is the ability to rationally think and arrive at a conclusion based on mathematical procedures and statements. Logical reasoning is used in everyday arguments and reasoning. Also known as critical reasoning, the tests are conducted either verbally or through written form. Logical reasoning is closely related to general intelligence. In a diagrammatic version, questions on relative position of items, number of items, their relation with each other, orientation and positioning, sequence, shapes and colors etc are asked. In verbal logic reasoning tests, usually a short passage is given and you are asked questions related to that. The questions may be on assumptions and inference. These tests are taken for jobs at finance sectors, banks, professional services, consulting firms and for fresher level entry jobs at software and hardware firms. Here you solve problems step-by-step. Analytical thinking involves breaking a complex problem into parts and examining each part by the facts and data available and reaching a conclusion. So your analytical skills are tested by such kind of questions. Sharon is sitting next to John. Jake is sitting between John and Ryan…. Ten books are placed one above another. History book is between physics book and biology book…. There are six members in a family. One of them is a professor. There are two couples and James who is a lawyer is the father of Andrew….. These questions need you to note down the facts and break the problem into parts. So on analyzing the statements, you reach a conclusion. This forms the crux and the interview finale. Here the answers will be in the form of structures and you need to describe the Situation, Task, Action and the Result of a particular situation relevant to the asked question. Also known as the STAR interview, it is asked to assess your past actions regarding a situation on the thought that it may be useful for future situation scenarios. So you will be asked questions regarding your previous work experience. Behavioral questions may be based on communication skills, teamwork, planning, creativity, accomplishments or handling situations. Tell me how do you pacify an unsatisfied client? .Give me an example when you had to push your idea to your leader? If your team member doesn’t agree to your idea, how do you deal with it? Tell me how did you deal with situations when your contribution in the teamwork was sidelined? Have you failed in meeting a deadline? How do you handle multiple projects? Did any of your idea influence the output positively? Tell us about your previous creative work which tops your rank list? Tell us when you were appreciated for a work? What do you learn from your accomplishments? Tell me about a tough challenge you faced and how did you tackle it? Tell me when you failed at work and your inference drawn from it? How to Answer Behavioral Questions? The key to answering the behavioral questions lies in the Case, Action and Result approach or the S- Situation, T- Task, A-Action and R- Result (STAR) approach. The first step is to describe a situation as the question demands. Be specific and that is very necessary. Tell them the task you were supposed to complete or solve. Also tell them the role assigned to you if it was teamwork. Describe the line of action that you implemented. Tell them about the problems and challenges faced while planning and implementing it. Explain the results of your action. Tell them if the task was completed successfully or not. And what were the benefits of the result. Try to tell them the accurate figures. Like instead of telling that the productivity increased, it is better to answer that the productivity increased by 10%. So prepare well ahead of the interview and have all the figures in your mind instead of just throwing out some random figure at the time of interview. Know what answer and examples should be given for specific questions. What are the points to be kept in mind while answering questions in an interview? Think out loud. Let the interviewers know what you are thinking and your line of thought. Approach each question with a smile even if you feel that the question is tough. When the answer is easy don’t give it out soon. Analyze the question first and then answer. Let your answer hover around the question. Don’t give unrelated answers. Never ever keep mum if you do not know the answer. Try to start with the analysis atleast. Never mind if you do not reach the answer. Back up your answers with examples. Let the examples be specific and upto the point. Try to provide innovative unique answers. Atleast try to be creative. In addition try to provide alternate correct answers also. Don’t be over confident or for that matter don’t exhibit your lack of confidence. It is necessary that a candidate prepares himself well before the interview. There are hundreds of candidates who have applied for the same job and are vying the same post. So do not take the matter lightly. Know that if you fail in the interview it is only because of your unpreparedness. So it is advisable to be prepared rather than regret later.